Public money is one of the primary currencies of influence for politicians and public servants. It affects the standards by which they undertake the nation's business and it impacts on the standard of living of the nation's citizens. The Politics of Public Money examines the extent to which the Canadian federal budgetary process is shifting from one based on a bilateral relationship between departmental spenders and central guardians to one based on a more complex, multilateral relationship involving a variety of players. In this innovative study, David A. Good examines this shift in terms of a broader societal change from an 'old village,' conditioned by old norms of behaviour, to a 'new town,' which brings with it new ideas about how public money should be managed and spent. 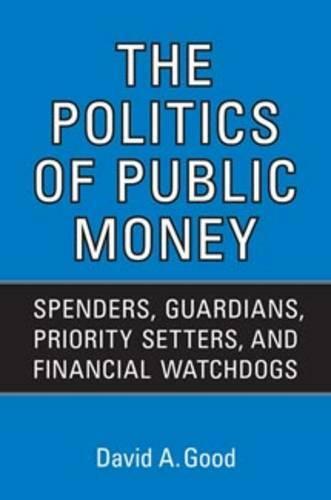 Organized into four parts, the book opens with 'The Changing Politics of Public Money,' which sets out a revised and expanded framework for analysing the politics and management of public money. Part 2, 'The Public Money Players,' looks at the motivations, interdependence, and independence of the four budget players. The third part, 'The Public Money Processes," deals with the central functions of budgeting - determining fiscal aggregates, making budget allocations, and ensuring effective financial management. Finally, 'New Prospects for Public Money,' looks ahead to the future and considers ways to strengthen the interaction among the players, and in so doing, improve the politics and management of public money. An insightful and incisive study of the changing budgetary process, The Politics of Public Money examines the promises and pitfalls of budgetary reform and sheds new light on the role insiders play in influencing government spending.